The government proposes to bring about major amendments in the Town and Country Planning (TCP) Act, 1977, and the Municipal Corporation Act to overcome shortcomings and ensure that there are no violations. In a major policy decision to ensure that teaching work in school did not suffer due to superannuation of staff, the government approved in principle a proposal to re-employ teachers retiring mid-way during the academic session till the end of the session. Chief Minister P.K. Dhumal introduced the Himachal Pradesh Prohibition of Cow Slaughter (Amendment) Bill 2010 and the Maharishi Markandeshwar University (Establishment and Regulation) Bill 2010 in the state Assembly today. With the State Pollution Control Board failing to monitor the critical volatile organic compounds (VOCs), their presence in alarming proportions in the state’s industrial hub of Baddi-Barotiwala-Nalagarh (BBN) has rung the alarm bells for environmentalists. Chief Minister P.K. Dhumal today said the government would not allow coming up of hydro projects, cement plants, tourism units and private universities in violation environmental norms and it was only yesterday that the Centre had recommended a Rs 1,000 crore project for sustainable development in Himachal to the World Bank. Coming down heavily on Dr KR Mani, director, Central Research Institute (CRI), Kasauli, the Central Administrative Tribunal (CAT) today asked him to depose before the tribunal on September 22 to explain as to why he changed his stand regarding granting hospital allowance to laboratory assistants. The recent appointments of three IGs in Mandi, Shimla and Dharamsala ranges have raised the eyebrows of the HP Police Service (HPPS) officers as the IGs, heading the ranges in place of DIGs, violates Section 8(2) of the HP Police Act, 2007. The HPPS officers further said the “new move” would block their promotion avenues. The voice of Rajendra Kachru, father of student Aman Kachru, who was ragged to death in 2009, will now be heard in a local court where the four accused are facing trial. Hundreds of farmers from all over the state marched to the Vidhan Sabha today to press their demand for prompt action on the government to effectively tackle the growing menace of monkeys, wild animals and stray cattle which were destroying their crops. A candidate seeking appointment as assistant professor in National Institute of Technology (NIT), Hamirpur, has won a legal battle in the Himachal Pradesh High Court after the court directed the authorities to not only appoint her on the post but also directed the chairman of the Board of Governors (BoG) and then Registrar of the institute to pay Rs 10,000 to her towards cost of the petition. Members of the Himachal Pradesh Medical Representatives Association here today held a demonstration outside the SDM office and raised slogans in favour of their demands and against the government for its apathy towards them. The police today seized 900 grams of heroin and arrested a resident of Nadaun in this connection. Replying to a question raised by Congress leader Sukhwinder Singh Sukhu about more than five-storey buildings in the state capital in violation of the norms, TCP Minister Mohinder Singh said cases of unauthorised construction were under the government’s consideration. He said there were 187 buildings, both government as well as private, which had more than five storeys, in violation of the norms. “The High Court, too, has taken a very strict view with regard to unauthorised structures and after scrutinising the cases, the government would taken action against violators,” he said. He said the MC had entrusted the task of undertaking a survey about the status of buildings, violations and other data to a consultancy which would submit its report in a time-bound manner. Sukhu said while the government was enforcing the law for the common man, big companies like the Jagson International Ltd, executing the Jakhu aerial ropeway, had raised 12 storeys in violation of all norms. Meanwhile, Harshwardhan Chauhan of the Congress said the government must take action against the violators or else people would be emboldened to break the law. Replying to a question on unauthorised mobile towers in the town raised by Kaul Singh Thakur of the Congress, Mohinder Singh said there were 152 such towers within Shimla municipal limits. “Legal notices have been issued to 108 while 19 towers have obtained due permission,” he said. He said within the next month, the government would take a decision on the issue. “We are in the process of finalising the Draft Mobile Power Policy and objections have been invited so that the final policy can be approved,” he said. Kaul Singh said the government, despite assurance, had neither imposed a penalty nor taken an action against defaulters. “The mobile towers, especially in residential areas, are a major nuisance and a health hazard which must be regulated,” he said. 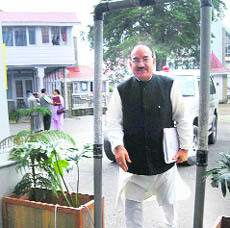 Raising the issue of employment to Himachalis in industrial units in the state, Kaul Singh and Anil Sharma disputed the figure of 80 per cent given by Industries Minister Kishan Kapoor. “The figure of 80 per cent jobs to bonafide Himachalis is disputable as labour force from outside the state are indicated as locals. Hence, a survey must be undertaken to get the exact and factual position,” he said. The decision was taken by the state Cabinet which met under the chairmanship of Chief Minister PK Dhumal here today. The modalities for implementation of the proposal would be worked later. As per another decision that all posts required for making a new school or an upgraded institution functional will be notified along with notification pertaining to opening of the school. The Cabinet deferred the proposal for restructuring of the Education Department under which separate directorates were to be created for class I to class V and class VI to class II under the overall charge of the director general of education. The department was asked to come up with a more detailed proposal. It also approved guidelines for private institutions running postgraduate classes. It decided to elevate the panchayat sahayaks who have completed eight years of service as panchayat secretaries. As per another decision, the excise and taxation inspectors, who have put in 12 years of services, will be designated as assistant excise and taxation commissioner. The Cabinet decided to raise the authorised capital of the State Power Transmission Corporation from Rs 5 crore to Rs 50 crore. Even though the HP Prohibition of Cow Slaughter Act 1979 prohibits cow slaughter and its progeny within the state, there is no provision to check the transportation of cattle from the state for slaughtering. As such the Bill has been brought in to put in place provisions for prohibition of the transportation of cattle. The Chief Minister also introduced the amendment to the Maharishi Markandeshwar University (Establishment and Regulation) Bill 2010, which seeks to replace the Ordinance without modification. Since the assembly was not in session and considering the urgency of the matter, the Governor promulgated an Ordinance earlier. In a recent air sampling conducted by local environment action group Him Parivesh in association with Chennai-based Community Environment Monitoring (CEM), 11 noxious chemicals were detected in an area of 200 m north west of the Morepen Road near Baddi. Four of the 11 chemicals detected exceeded the US Environmental Protection Agency (EPA) Region 6 levels, which were standard safe levels in the air. These chemicals target the eyes, skin and respiratory system, central nervous system, liver, kidneys, reproductive system and even the cardiovascular system, blood, heart and the peripheral nervous system. With detection of two carcinogens the risk of locals acquiring cancer had risen as chloroform was detected 321 times and methyelene chloride was detected 6.8 above the safe limit. Board’s Member Secretary Dr Nagin Nanda said as per the ambient air quality norms prescribed by the Central Pollution Control Board protocols for merely two VOCs were in the initial stage of being developed. Since a road map was being finalised after which guidelines would be issued to the states they had no mechanism to monitor these VOCs. As a beginning, only 16 cities would be covered for which an action plan was being prepared. Moreover, such testing was expensive and the US standards were not comparable to the Indian standards. Mansi Asher, an activist of CEM, confided that Tedlar Air Sampling was used to collect the air samples. The location was chosen on the basis of the stench in the area. There was a strong odour in the air at the time of sampling. “The odours caused hot flushes, eye burning, throat irritation and heaviness of head among the members,” confided Balkrishna Sharma, general secretary, Him Parivesh, while releasing the report to the media today. “The sample was tested in a US-based laboratory, Columbia Analytical Services, with which we have been working for some years now,” said Shweta Narayan, an activist of the CEM. The results detected 11 types of chemicals in the air sample. The report has exposed the ineffectiveness of the Pollution Control Board in checking and monitoring this kind of pollution. He was replying to a resolution moved under Rule 130 on eco-tourism promotion and environment protection by CLP leader Vidya Stokes and Congress legislators Kuldeep Pathania and Mukesh Agnihotri. Opposition members expressed serious apprehensions about the dilution of Section 118 of the Land Reforms and Tenancy Act and change of land use by providing prime land to private universities, including the proposed Rayat Bahra University near Waknaghat. The Chief Minister informed the House that private universities had bought private wasteland and no government land had been given to them. “We are in the process of formulating a Bill to regulate private universities and in case of violation their property will be forfeited and heavy penalty imposed on them,” he said. He said in case of power projects, photo monitoring was being put in place to check violations and the provision of at least 15 per cent discharge in rivers was being strictly followed along with scientific disposal of muck,” he said. Dhumal said so far only 10 eco-tourism projects had been given to private parties out of which only three were functional. Initiating the debate, Stokes said all areas falling above 4,000 feet should de declared eco-sensitive zone where only public services like hospitals, schools and other essential services should be allowed to come up. “Already irreparable damage has been caused to the fragile hill ecology on account of power projects, highly polluting cement industry and now private universities,” she said. She said the manner in which a catastrophe had hit Leh, the situation could be even worse in Himachal if precautionary measures were not taken. Agnihotri urged that Himachal must review its development policy as even the Shukla committee report had also echoed serious environmental concerns over the coming up of power projects. Suresh Bhardwaj of the BJP said there was need to ensure that there was no damage to forest cover and expressed concern over the 12-storey structure raised by Jagson International at the site of aerial ropeway. The tribunal directed Dr Mani to be present in the court on the next date to explain as to why he changed stand from time to time while filing these affidavits, as it was painful that court’s orders have been taken so casually. Four persons working as laboratory assistant at the clinical laboratory of the CRI had filed an application before the tribunal wherein they had sought Hospital Patient Care Allowance. Pronouncing the order, the CAT had directed the respondent to reconsider the matter and pass a detailed reasoned order. Subsequently, the applicants filed a contempt petition in the case due to non-compliance of the orders. Though the tribunal had been dissatisfied with the action taken by the respondents on several occasions, no stern orders have been pronounced. In one of the affidavits submitted by Dr Mani it was mentioned that employees namely technical supervisors, laboratory technician, laboratory assistant etc were directly exposed to all sorts of infected materials. Whereas in another affidavit submitted by him he had stated that only non-ministerial employees come in contact with patients and the allowance was to be given to patients that come directly in contact with patients. Besides, the appointment aimed at making way for the“commissioner system in the state” without amending the HP Police Act, HP Police rules and CrPC rules, they pleaded. According to the HP Police Act, 2007, Section 8(2), “Only the DIGs will head three police ranges of Mandi, Shimla and Dharamsala and issue the C-2 certificates to SPs. “The DIGs will report to the IGs of the south, central and north zones”, the Act stipulates. There is no provision in the Act that IGs will head the ranges that consists of two or more districts. As per the Act, the recent IG appointments in the ranges are not legal under the police Act, resented HPS officers. In fact, the HPPS officers are recruited directly by the state commission or some of them are promoted from the ranks of inspectors and other sports quotas. The IPS officers come from the direct recruitment from the UPSC and some of the HPS are promoted as IPS from the state service. The HPS officers said the “new system” has upset the entire police hierarchy as there will be no DIG between the “IG range and SPs in the districts. “As a result, the government is likely to depute DIGs in each district in place of SPs that will adversely affect over 200 HP state cadre officers’ aspiration to head the districts as they may not reach the stage of DIGs”, they feared. Himachal’s latest “civil list of IPS officers” shows that HP cadre has a jumbo team of 21 IGs against the “sanctioned 10 posts in the state”, sources said. On the other hand, the IPS Officers’ Association has pleaded to the government to abolish the DIG’s post as “it has also blocked their promotion as commissioner” by two years. “The SPs should be promoted as IGs not as DIGs directly as many states are doing following “commissioner system”, they said. Fast Track Court Judge Purinder Vaidya today allowed the prosecution to examine Rajendra Kachru as the victim had reportedly told him about the ragging incident that took place on March 6, 2009, at the Tanda Medical College. The call for staging protest during the ongoing monsoon session of the House was given by the Kheti Bachao Sangharsh Samiti, an apex body comprising farmers and fruit growers’ organisations active in various parts of the state. 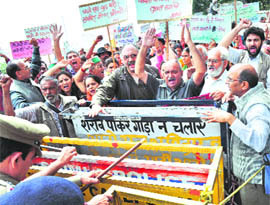 The protesting farmers assembled at the Panchayat Bhawan and came to the Vidhan Sabha in a procession raising slogans in support of their demand. President of the Himachal Kisan Sabha Kuldeep Singh Tanwar, Ravinder Chauhan from the State Fruit Growers’ Association and Satyawan Pundir from the Himachal Gyan Vigyan Samiti (HGVS) were among those who addressed the gathering. They underlined the need for scientific culling of monkeys and other wild animals to save farmers from being ruined and warned that failure to take effective measures to tackle the problem would have wide ramifications for the entire agrarian sector in the state. It was pointed out that as many as 2,301 out of a total 3,243 panchayats were plagued by the problem and according to the government estimates an annual loss of Rs 2,000 crore was taking place because of the wild animal menace. Nearly 50,000 hectares in the state was kept barren due to the menace. The impact was so wide that almost 5 lakh families were directly involved for more than 200 days per year in protecting the crop and fields from wild animals. The total loss in mandays came to Rs 100 crore annually. Further, of late the incident of attack on the human population had also been increasing, putting the lives of people under threat. “Though my name was recommended by the selection committee along with one another candidate (which became clear from the RTI), was not given appointment due to alleged discrimination by the NIT authorities,” she added. While one candidate was given appointment but the applicant was denied the same despite being second in the selection list after which she approached the court. Meanwhile, the NIT authorities have filed an appeal against this order in a Double Bench of the high court. Led by state secretary Ashok Verma and local unit secretary Rajeev Kapoor, medical representatives gathered outside the SDM office and held demonstration. However, they were barred from attending the scheduled rally in the town for want of permission from the authorities as Section 144 of the CrPC was already in force in the town due to the ensuing Navratras. They submitted a memorandum to the Centre through the Kangra SDM. They said the state government should implement the Sales Promotion Employees’ (SPE) Act besides minimum wages, leave rules, provident fund and bonus be given to the MRs permissible under SPE Act. They demanded that SPE Act should be extended to other industries too. The value of the seized contraband in the international market is estimated to be about Rs 1 crore. DSP of crime branch Brajesh Sood said, “On a tip-off, a joint team of the crime branch and the Nadaun police today stopped an Indica car no HP-55 6602 near Lohar Kotlu on the National Highway no 88 near Nadaun at about 1 pm and seized a packet containing 900 grams of heroin hidden,” he added.